Based on The Knight Project manual, for building your own Knight Rider KITT or KARR replica. Parts kit only, as shown. Includes all electronic components required to assemble the electronics featured in Stage 2 of The Knight Project book. Also includes all electronic components for the voicebox and 4-step sequencer of Stage 1, also from The Knight Project book. We put together only a few of these parts kits which we are listing at our cost. 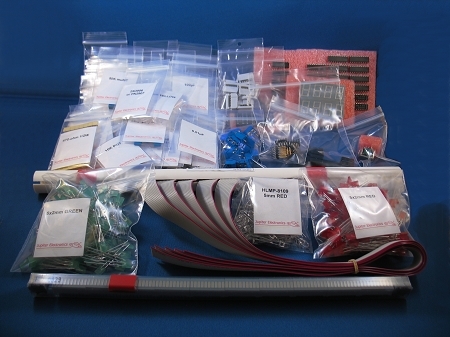 A total of approximately 800 components, including LEDs, resistors, integrated circuits, capacitors, transistors, connectors and custom flat cable assemblies. Excellent opportunity for the casual electronics hobbyist who wants to assemble his own set without stocking up on extra parts. Get just the right components in a single purchase instead of searching everywhere. Does not include any plan or any instructions. You will need The Knight Project manual for schematics, parts lists and assembly instructions. This is available separately for about $50. Does not include printed circuit boards either. You will need the Main Group at $99 and the Voicebox Group at $30.